First off, I want to make it clear that I'm not much of a zombie-fanatic, and I haven't read/wrote/watched very many things involving zombies. However, I have watched quite a few mystery shows and read several mystery novels. 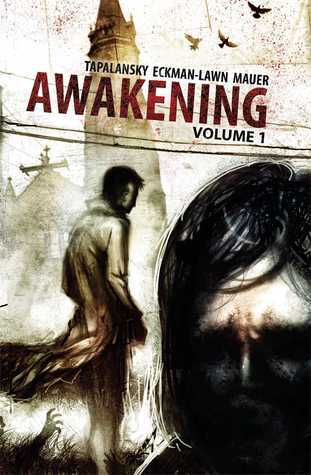 That being said, the first volume of Awakening went beyond what I expected from zombie fiction. Not the usual "in-your-face" blood, guts, zombie-shoot-em-ups, and survivor groups. It's an interesting mystery approach to zombies. However, I feel that while it's really no surprise in the story at all. Zombies! I don't really care where they come from. I just want to know if everyone dies or if the main characters manage to stop the destruction. At this point in the series, there is no confirmation that the zombies are even the problem. There is just speculation and investigation, like a mystery. I can at least show appreciation the steps that the author takes to effectively run the investigation. Unfortunately, this volume lacks a strong character. Most of them are long-standing stereotypes of a mystery novel - the would-be informant that no one listens to because people think she's insane, the lone ex-detective who has a secret past that haunts him, and the lab guy.I enjoy the art style. Grungy, dark, haunting. Like the subject of the graphic novel. It vaguely makes me think of the illustrations in Surrogates, but only vaguely. It embodies the darkness and murkiness of the plot and the on-going investigation. There are occasional spots of clear art... I'm trying to figure out the artist's intention of that.This volume of Awakening leaves a lot of questions to be answered, and I'll probably continue reading it just for an occasional brain dump. Some final irritating questions. Why does it feel like the author forced character development - predictable at that - onto the main character? Why did he incorporate stereotypes of a detective story while he had an interesting angle of a zombie story? I can definitely say, though, that a cool new angle means nothing if there isn't a strong backing of characters. I really enjoy the story, and I really enjoy the art, but I'm not sure I enjoy them both together. They're both too hectic; I feel like they should each be paired with something more stable to bring out their unique qualities. I would be absolutely interested in more work by the writer and the artist, just not together. Love the collage style art -- more graphic novels should look like this. I was intrigued by the detective angle on the zombie story, but found the characters blended in with one another and it was hard to see the story clearly. The illustrations were fantastic -- I think the text should have anchored them better so they functioned as a cohesive whole. THIS IS A MUST!! Both Edgy and Horrifying as you await the unexpected. You feel death in the air as you would rain or a terrifying storm. The graphics and lettering are darkly superb with clear precise artistry. Dark, yet intriguingly beautiful graphics, create a mood of mystery for this comic book adventure. Part crime scene investigation, part zombie mystery, I am drawn into the story and look forward to the next volume. I am eager for the next volume; the first does a great job of hooking you but it leaves you with so many questions. The narrator is a little distant but the art brings you closer to the action. I feel it's too early to say how I really feel about it, but I'm looking forward to more. Loved the artwork, but the story line felt disjointed and confusing for me. I am intrigued enough to have started volume 2 to see if it comes together better for me. What a great story, I love zombies and I love noir. I never thought the two could be put together so nicely. A dark tale, disturbing and inspired. Unsettling and beautiful art work, intense writing and a story that has me hooked. Highly recomended. Points for trying something new in the storytelling and art, but overall this book was bellow average. Mediocre at best. I really enjoyed this graphic novel. Dark and disturbing combining zombies and corporate corruption, this series will be up there with the Walking Dead. honestly, i read this and i'm not sure what my damn stars are yet. i'm engaged.i'm also seeing a million others in the pages here.and seeing a lot of blurry.hmm. fantastic artwork. Love the impressionistic, collage feel. But the story and characters were flat and not at all compelling. The plot didn't really go anywhere. Meh. The art was great, but in some places too stylized or abstract to convey the story. Not to be confused with Kate Chopin's "The Awakening." I loved the artwork in this book but the writing and story just didn't hold my interest. Nick Tapalansky Alex Eckman-Lawn - Nick Tapalansky writes some comics that you should totally read, including the forthcoming graphic novels Cast No Shadow, Samantha Loring and the Impossible World, and A Radical Shift of Gravity. His work has also been included in the award-winning Popgun and Mouse Guard: Legends of the Guard anthologies. He currently lives in New York with his patient wife and amazing daughter. You can hang out with him online at nicktapalansky.